Last year I had the amazing opportunity of being a filming teacher in a partnership with the Digital Library and Illustrative Mathematics . Through this process, I was filmed by The Teaching Channel, and they produced this video of introducing ratios. Today was take 2 of Perfect Purple Paint (the 6th grade entry version). I wanted to see how student’s thinking would compare to last year and if the launch would be as successful. Today though, I wanted to apply a formative assessment. I wanted to give the task without blocks first and then with blocks, second, to compare the success rate and level of understanding. I started by introducing the question and giving private think time (without blocks). I gave students about 7 minutes of private think time (without blocks). Note: No directions were given as to how a student could show thinking. At this point, about ¼ of the students had a correct answer based on prior knowledge. 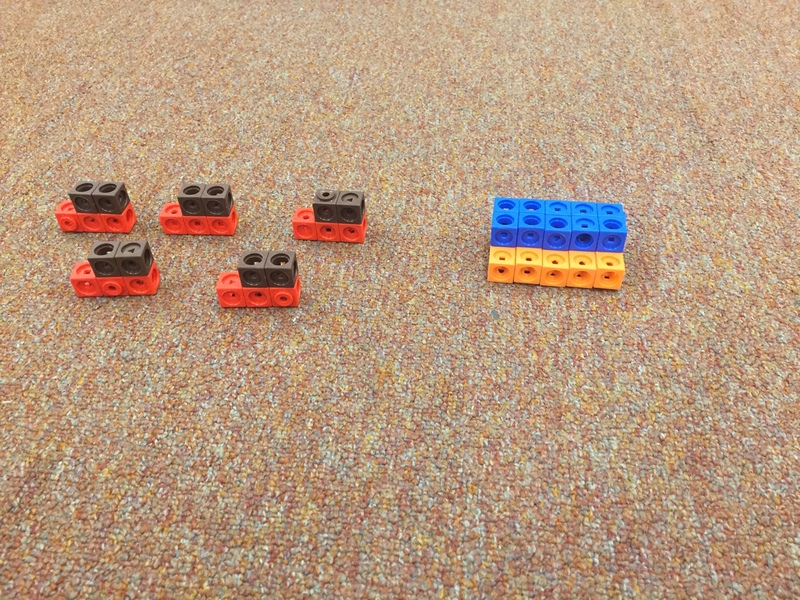 I asked students to return to their seats and begin building models, in their table group, to show the ratio and solution (below are different examples from the same group). .
We came back together as a group (we sat in a circle) and laid out all of our models in front of us. Students were asked to identify similar models. 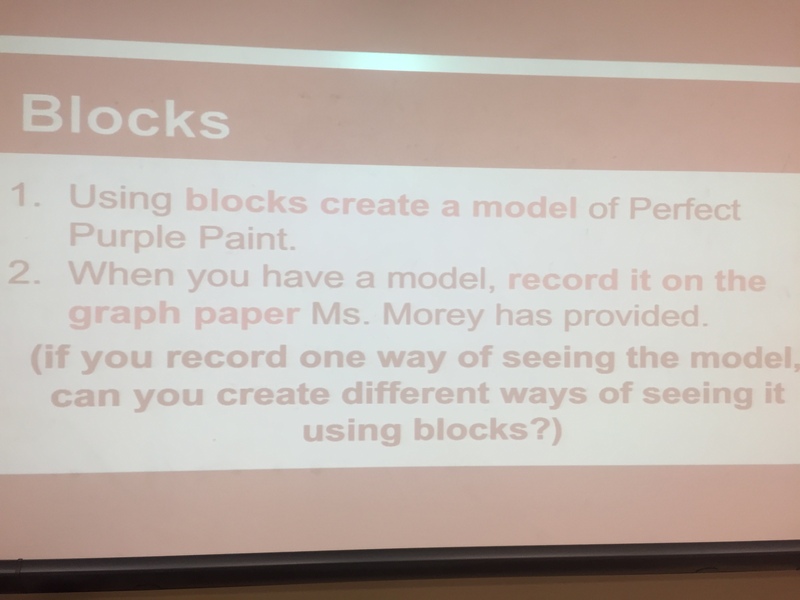 (below are models the students connected to one another). Students were asked to explain how they connected to one another. 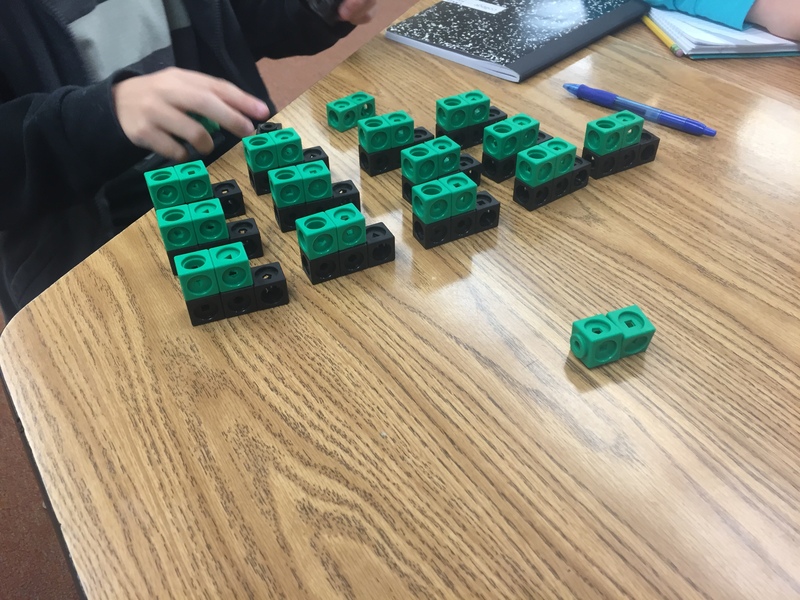 Students were asked how these models showed the 2 to 3 ratio and to physically point out the initial ratio. After a series of sharing the ideas, the groups returned to their seats to draw models and past into their notebooks. 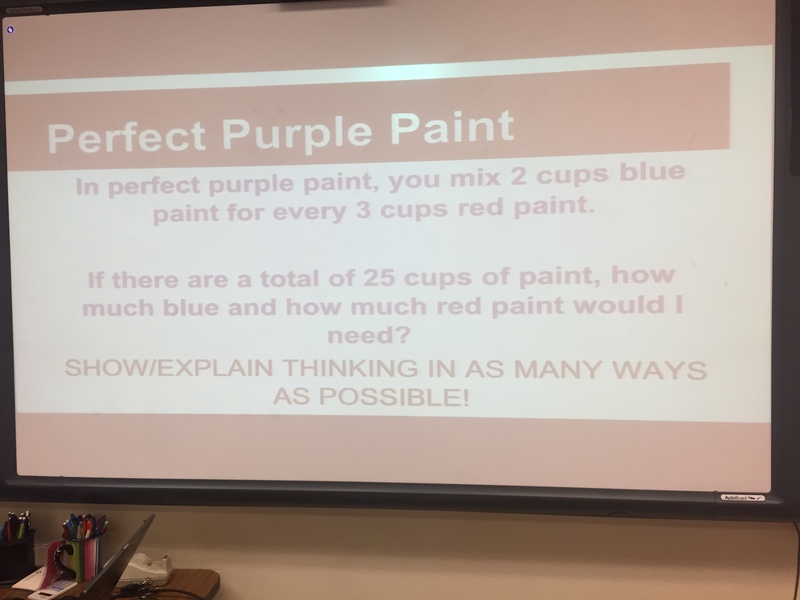 (Note: By this point, 80% of students could successfully build and explain the number of cups needed that kept the original ratio in place). I am left thinking how I can improve asking equal questions to students who both appear to have correct models and those that do not. It is apparent that students still feel generating an incorrect model is punitive and thus, begin to shut down when they realize that their model needs changes made to it. Changing the mindset of these students, is going to take some real time and effort. At times, I question my abilities in this arena. My wondering to all of you (whom may be reading) is how do you help change mindset to one of fixed to growth? What strategies do you use when students sit almost paralyzed when they think they can’t do something? When I come across a frustrated, seemingly clueless student, sometimes the best thing I can say is something like, ” tell me what you do understand about this.” and so often the student can tell me much more than they, at first, realized they could. I absolutely love that question!!! I think That puts the thinking power back into the students’ hands! Mike: I absolutely love how point and how such an open ended question demonstrates to all learners that their opinions and thoughts are of value in the classroom. 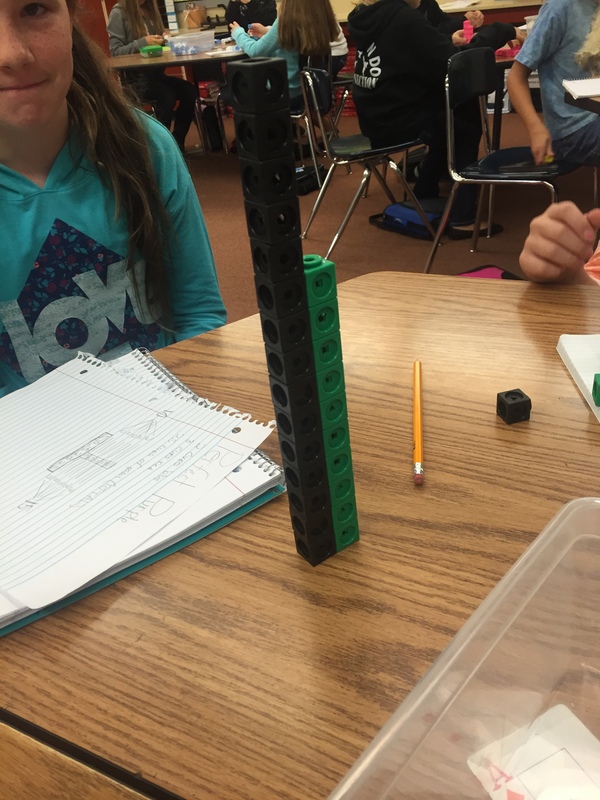 I love the lesson idea that you posed here.. and would love to use it this year in my classroom! Thank you so much for your thoughtful response. Your insight was exactly what I needed! It’s an important question isn’t it. Getting away from that fear of mistakes. I think Mike is right, and lots of number talks. Finding questions like his six-question where there’s lots to notice at all different levels gives everyone an entry. Doing it individually and then in pairs before sharing with the whole class gets everyone talking. Accepting all kinds of answers, recording them, thinking about them. one girl was doubtful that her contribution was valid. She had noticed that there were triangle-shaped holes in some of the triangles. (I can see how she’d think it wasn’t relevant or mathematical, but then she probably doesn’t know about Sierpinski triangles. Yet. Now there’s a reason to have a look at them, something I’ve never done before! Wow!! I agree with that task Simon… What a launching point into talking about what they notice. At times it seems putting these tasks in a sequential format that does highlight the standards is a challenge. What are your absolute favorite tasks of the year? I like so many. Maybe i should do a “top ten”! But I like it especially when students get a lot of choice. 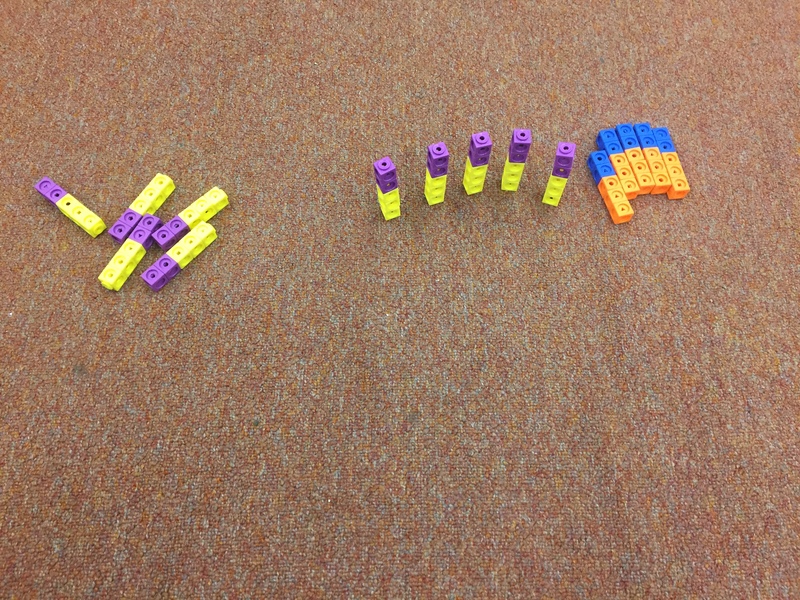 We like growing pattern activities (à la visualpatterns.org) and usually run them 2 or 3 times in the year, with different materials: Cuisenaire rods, matchsticks, multilink cubes. You can approach these on so many levels. I try to encourage the students to keep their patterns simple. They often lead us into discussion of square numbers, triangle numbers and the like. And although there’s a wrong and a right, there’s no wrong pattern. This year I’m going to add the dimension of graphing the patterns on desmos with them and looking at the kind of line we get. How did I not know about visualpatterns.org ?? I absolutely love these tasks and enjoy the different graphics that are presented as part of the lesson. 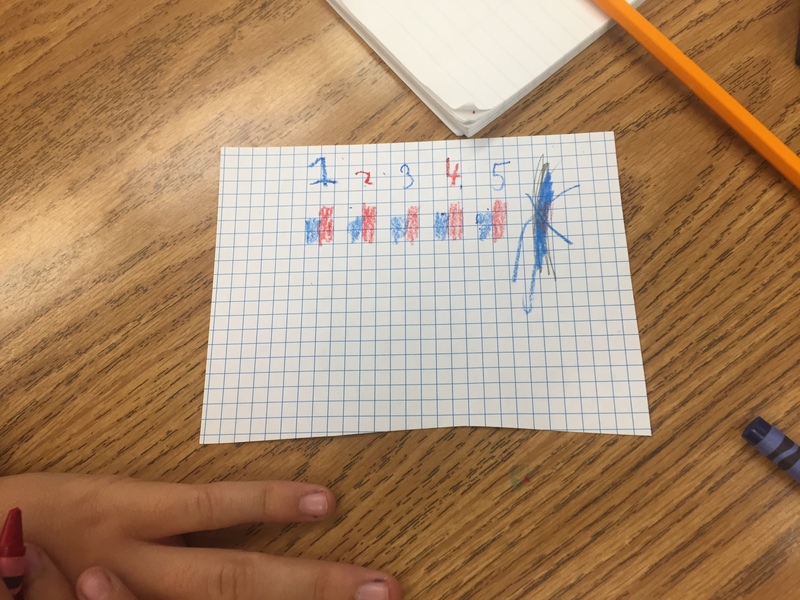 To your blog attachment, what a great way to have students create patterns and analyze what they created. I can see why they may need to keep it simple! I have only explored desmos through the classroom activities, which I absolutely love. Will you blog and send me a link when you have students create on desmos? I would love to see what you are doing with it!